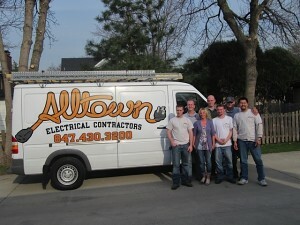 Alltown Electric Inc specializes in high quality electrical services in the area of Park Ridge IL. As Electrician in Park Ridge IL we handle all our customers with care and respect. These are firm qualities of our business. Our customers love the fine job we do, as well as our reasonably low prices for the current market. We have practiced our Park Ridge electrical services for years and have accumulated valuable knowledge in the industry. We guarantee that you will be happy with our services. If not, we will return to do the job again to your complete satisfaction. To better improve our company, we participate in Customer Satisfaction Surveys, Financial Surveys and Employee Satisfaction Surveys, which are compared to hundreds of other companies. Our experienced and knowledgeable estimating team will treat you like customer #1. Whatever your electrical needs, we have specialists to get the job done right the first time. At Alltown Electric Inc we believe the most profitable relationship is that which benefits the entire community. Our team or Electricians in Park Ridge is versed in energy-saving techniques and products. Alltown Electric Inc now offers audits of your home or commercial electrical systems. We will come in and perform a complete visual inspection of your electrical system which includes the breaker box, outlets, wiring, loose connections, moisture intrusion, weather damage, and any other red flags that could cause outages or safety concerns of your property or place of business. To learn more about our electrical evaluation audits, visit our testimonials pages. We and every of our local Electrician in Suburbs are equipped to manage all of your commercial building electrical requirements at every level-from multi-million dollar new-build projects to minor electrical installations and repairs from Electrician in Park Ridge IL.